Biomes are very large ecological areas e.g. tropical rainforest. 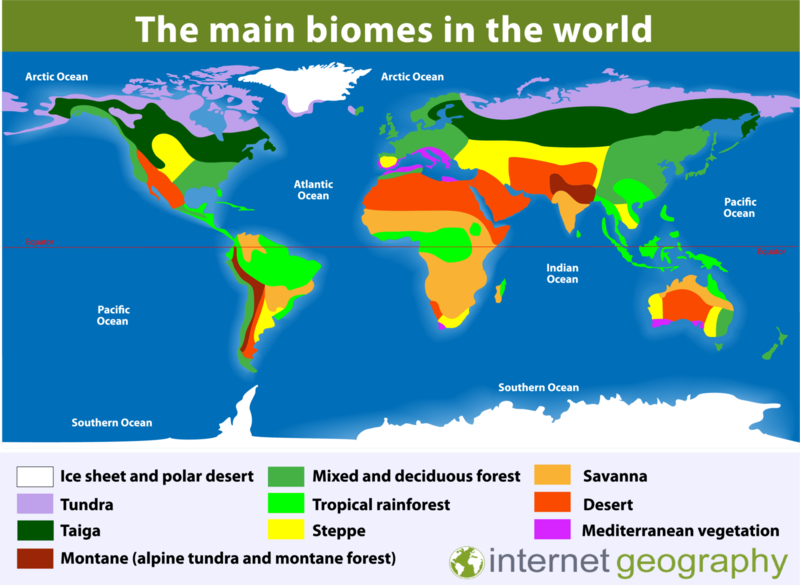 The map below shows 10 of the world’s main biomes. Biomes contain fauna and flora (animals and plants) that have adapted to the environment. Biomes are often defined by abiotic (non-living) factors such as climate, relief, geology, soils and vegetation. 23.5° north – 23.5° south of the equator. Hot and wet all year. Rich in plants and animals. Within the tropics. Mainly between 5° and 15° north and south of the equator. Hot with a wet and dry season. Mainly grass and a few specially adapted trees. 15-30° north and south of the equator. 30-40° north and south of the equator. Hot, dry summers and warm, wet winters. Mainly scrub vegetation – plants adapted to summer drought. 40-60° north and south of the equator. Cool summers and mild winters. Warm summer and very cold winter. 60° north of the equator and on mountains. Below freezing for most of the year. The ground is permanently frozen. Very cold all year round. A permanent or semi-permanent layer of ice. Mainly found in the Arctic and Antarctic.